Start and end Maun Airport. Moremi Crossing is a new 16 tent camp built on a palm fringed island surrounded by the Moremi’s game-rich seasonal floodplains and overlooking Chief’s Island. 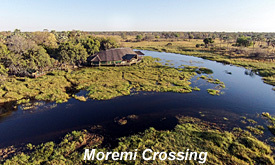 Moremi Crossing is a new style safari camp combining luxury with simplicity. This is a 100% eco-friendly development featuring the latest in solar and waste disposal technology. 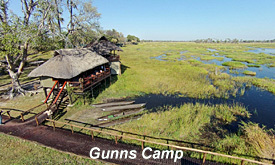 Overlooking the legendary Chiefs Island and bordering the Moremi Game Reserve, Gunn’s Camp is one of the last few remaining luxury, vintage safari camps. Set under leafy palms and African Ebony to blend naturally with its unique surroundings, Gunn’s Camp achieves a fine balance of comfort without isolating guests from the sights and sounds of the wilderness. 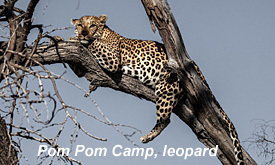 After your morning safari activity and breakfast, you aree transferred by air to Pom Pom Camp in the Okavango Delta. 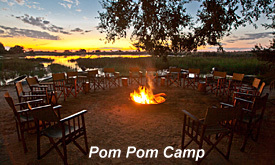 Pom Plom Camp is located on Pom Pom Island in a private concession situated in the heart of the Okavango Delta and on the head waters of the Xudum river system. The area lies on the western boundary of the Moremi Game Reserve and offers superb Okavango scenery and a true Okavango wilderness experience. 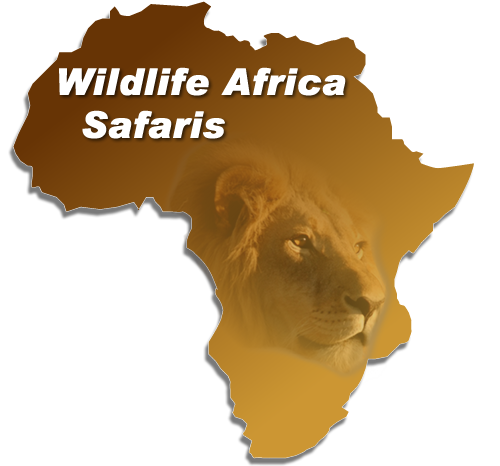 After your morning safari activity followed by breakfast you are transferred to Maun Airport for your outbound flight.